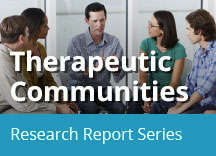 Home » Publications » Research Reports » Therapeutic Communities » Are Therapeutic Communities Effective? Overall, studies find that therapeutic community (TC) participants show improvements in substance abuse, criminal behavior, and mental health symptoms; this is especially true of participants who enter treatment with the most severe problems (De Leon, 2010; Vanderplasschen et al., 2013). Source: Hubbard et al., 2003. The largest long-term outcome study of addiction treatment interventions to date was the NIDA-sponsored Drug Abuse Treatment Outcome Studies (DATOS), which examined the effectiveness of several types of drug abuse treatment programs in the United States, including TCs, methadone maintenance, outpatient drug-free treatment, and short-term inpatient programs. DATOS found TCs to be effective. Participants who showed improved behavior after 1 year continued do so after 5 years, which was also true of the other modalities studied (Hubbard et al., 2003). Length of time in treatment was found to be important for TCs, as well as for other modalities. Participating for at least 3 months was associated with better outcomes at 1 year—a finding that is consistent with other research showing the importance of treatment duration. At the 5-year follow-up, TC participants showed significant improvements compared with the year before entering treatment, which was also true for methadone maintenance and outpatient drug-free treatment. Participants from all three treatment groups had reduced prevalence of weekly or more frequent cocaine use by 50 percent, decreased illegal activities by 50 percent, and increased full-time employment by 10 percent compared with the year before entering treatment. Among DATOS participants in TCs, better 5-year outcomes (such as reduced cocaine, marijuana, and problem alcohol use and illegal activity and increased full-time employment) were associated with remaining in treatment for 6 months or longer. Research indicates that TCs modified for prisoners and people with co-occurring disorders are effective (see "How Do Therapeutic Communities Treat Populations with Special Needs?" and "How Are Therapeutic Communities Integrated into the Criminal Justice System?"). Participants with less severe problems participating in outpatient or day treatment at TCs also show increased positive outcomes (e.g., for social problems and psychiatric symptoms) (De Leon, 2010). Studies consistently find a relationship between duration of treatment in a TC (i.e., retention) and aftercare participation and subsequent recovery (De Leon, 2010; Vanderplasschen et al., 2013). Dropout is a concern with all treatments for addiction, and TCs are no exception. Dropout is most likely during the first few months of treatment (Vanderplasschen et al., 2013). What is a Therapeutic Community’s Approach? What are the Fundamental Components of Therapeutic Communities? How Is Treatment Provided in a Therapeutic Community? How Do Therapeutic Communities Treat Populations with Special Needs? How Are Therapeutic Communities Integrated into the Criminal Justice System? How Are Therapeutic Communities Adapting to the Current Environment? Where Can I Get Further Information About Therapeutic Communities? NIDA. "Therapeutic Communities." National Institute on Drug Abuse, 23 Jul. 2015, https://www.drugabuse.gov/publications/research-reports/therapeutic-communities. NIDA. Therapeutic Communities. National Institute on Drug Abuse website. https://www.drugabuse.gov/publications/research-reports/therapeutic-communities. July 23, 2015.